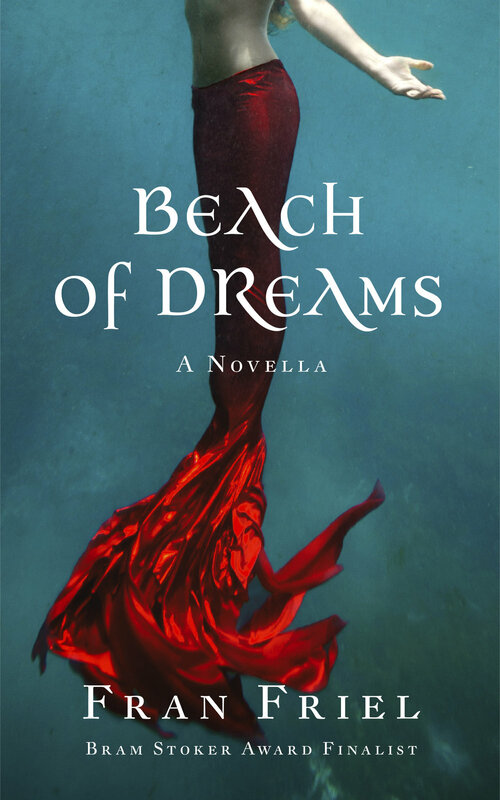 Excerpt from Bram Stoker Award Finalist, Fran Friel's - BEACH OF DREAMS: "With dawn still hours away, the storm howled through the cavernous spaces between the carcasses on the beach. Simon Rodan’s lantern swayed in the wind, the wan light dancing with the shadows amidst the massive bodies. Their size made it impossible to see the forms in their entirety. Beached Giants was all he could think when he saw the lifeless shapes crowding the shoreline..."
GET YOUR FREE COPY OF BEACH OF DREAMS! Bessie has arrived...and she's waiting for you in the Pandemonium Garden! Time is ticking on for Bessie, but an unexpected gift and an unintended pact results in an unbelievable treasure. Her life is forever changed, but can she make the horrific sacrifice demanded to sustain the lush magic bestowed upon her? Is it demons or angels that have cast the pandemonium? Grab this "intriguing, unexpected read" and discover the mystical path for yourself! I love Fran's work. I have found that every one of her stories are intensely memorable and I love the short reads. She is a master of atmosphere, and there is something of real depth in each story if you choose to find it. This whimsical story invites us to reconnect with our Pagan roots and remember the spirit of nature, but no belief is required. It is both a story and an invitation to be enjoyed or pondered in equal measure. It is poignant, heartwarming, and mysterious. Four stars because five is only for the very best of anything, but highly recommended as a great and rewarding way to spend a pound and while away an hour or so in another World. "Fran Friel...Her stories are well written, compelling, all with a muscular hard edge...and always absolutely brutally chilling. From the short-short shockers...to the longer moving ones like 'The Sea Orphan' and 'Beach of Dreams,' that jar you and linger like a solid, well-placed left hook to your kidney...And from such a nice person. Highly recommended." "Fran Friel...she entertains, she instills honest emotion...and she leaves the reader with more than a little food for thought. We emerge richer for the experience, perhaps even with our world-view slightly altered. What are we witnessing? The beginning of a long and grand writing career." "Fran [is] something else, her work something exceptional. When you hold this kind of ability inside yourself for a long while, eventually when it's time to release it it's like letting loose a stream of fireworks into the night sky." "Who the hell is Fran Friel? A writer to watch! She's gonna to go far, just you wait and see. Look out, though, ['cause] she's just getting started. Like the song says: 'You ain't seen nothin' yet!'" What magic has the Widow, Maire Pennycock, bestowed upon her only son, Young Will, to survive the adventures and adversities of their petty village and the Pirates of the Atlantic? Can he embrace his true heritage before it's too late? “The Sea Orphan” is a marvelous cross-genre blend of pirates and witchcraft all wrapped up in a distinctive period piece blanket. When young Will Pennycock finds himself orphaned...he sets off on an adventure that will lead him to the high seas with a band of marauding pirates. It’s at once a story of despair and the occult, of hope and adventure, and walking the wobbly gangplank of life. Impressive in its authenticity and boldness in not shying away from the decidedly nefarious intentions of ship’s mate Duncan Rutt, “The Sea Orphan” is an enthralling read." Just Click the Button Below to get your FREE EBOOK! You will also receive EXCLUSIVE discounts, entertaining news, and more FREE stuff! "On a remote island in the Pacific Ocean, an anthropologist makes an other-worldly discovery that could rock the world and save his languishing career, but the island has other plans. Will the buried truths of Simon Rodan's nightmares devour him or can he face the demon trials necessary to truly save his life?" “Beach of Dreams,” the story of anthropologist Simon Rodan and his quest to get the perfect photograph of some mysterious giant creatures that wash up on the shores of the unidentified tropical island where he is stationed. What follows is a wildly inventive, hallucinatory tale of surrealism that brings the protagonist from the egoism of discovery to the altruism of self-discovery. With BONUS FLASH - Orange and Golden! Darkness lurks in the most unexpected places, especially Under the Dryer! A dark story of bravery, loyalty, hubris, and love told through the eyes of Goliath. Is the Old Lore of the Great Mastiffs true? Will Goliath's efforts be enough to protect his oblivious humans and his best friend, Teddy, from the Ancient Evil? Grab your copy of this poignant, yet darkly humorous story that will make you think twice about looking Under the Dryer! "Friel masterfully takes a preposterous premise that verges on silly (evil dust bunnies, come on!) and again creates an emotionally resonant portrait of loyalty amidst the bloodletting." Fran's Bram Stoker Nominated Collection, Mama's Boy and Other Dark Tales, is being prepared for a new release with retooled originals and additional dark tales added to the mix. The Darker Side of Fran Friel is COMING IN 2018! You can follow Fran's latest antics at FACEBOOK and Fran's AMAZON AUTHOR'S PAGE!